Quotation - Michigan Granite, Marble & Quartz countertops at affordable prices! Get a free online quote in 3 easy steps! Upload the file to us and you’re done! Please provide us with as much information as you can regarding your project. This includes: layout and measurements, granite color or group, edge, personal information including the job address, contact information, and any other details that will help us determine the quote of the job. Once you submit the quote, we will contact you in no more than 24 hours with the pricing of your project. 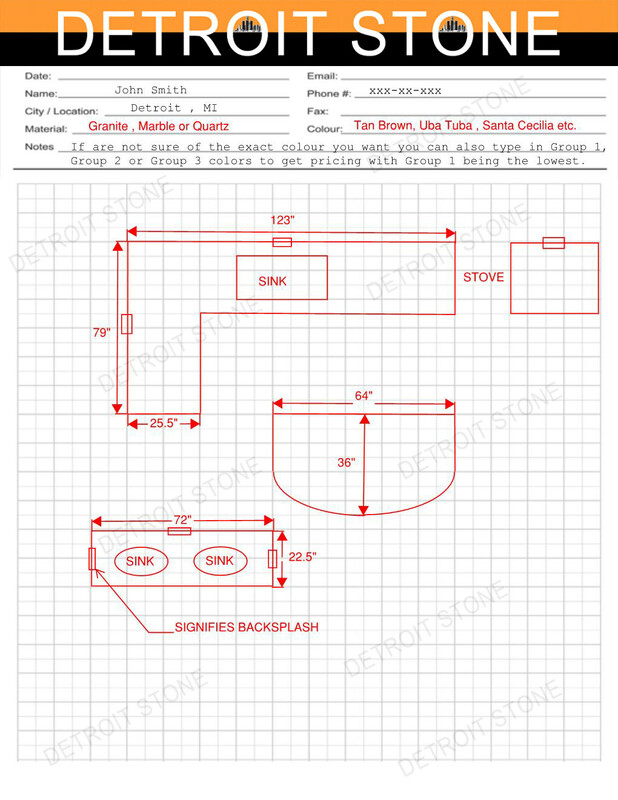 You can always come in and visit our showroom with a layout or just a simple drawing with measurements. We will plug those numbers into our software and get you the best price in no time. Bring along samples of your cabinets, tile and any other helpful interior pieces that will help you select the right stone for your home. We will help you choose a material that best suits you. We feel that meeting with you in person is the easiest way to get a quote since you would also get to see our selection in the warehouse along with any advice you might need.